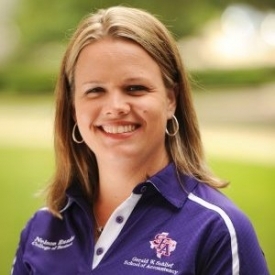 Kelly Noe is currently an Assistant Professor and Interim Director in the Gerald W. Schlief School of Accountancy. She has worked in private industry, governmental and non-profit accounting. She holds the Treasurer position for a State-Wide, University-Wide and local non-profit. Her research interests are in the use of Medicare Cost Reports in quality measures and the investigation in the behavior of Medicare Providers.